Very good tutorial, sir! In my setup I had to adapt the cloud connections a bit by using the GNS3 VM server cloud and connecting to eth0, but after that it worked quite nicely.... In GNS3 i am using c7200 image and router with only 1 fast ethernet port which i connect to my wifi card on the cloud. After following the setup i see that the router is receiving packets on it�s f0/0 port but is unable to ping any IP, even my laptop�s IP. Is there anything else which i need to do or need to provide more info to explain the issue? Thanks in advance. 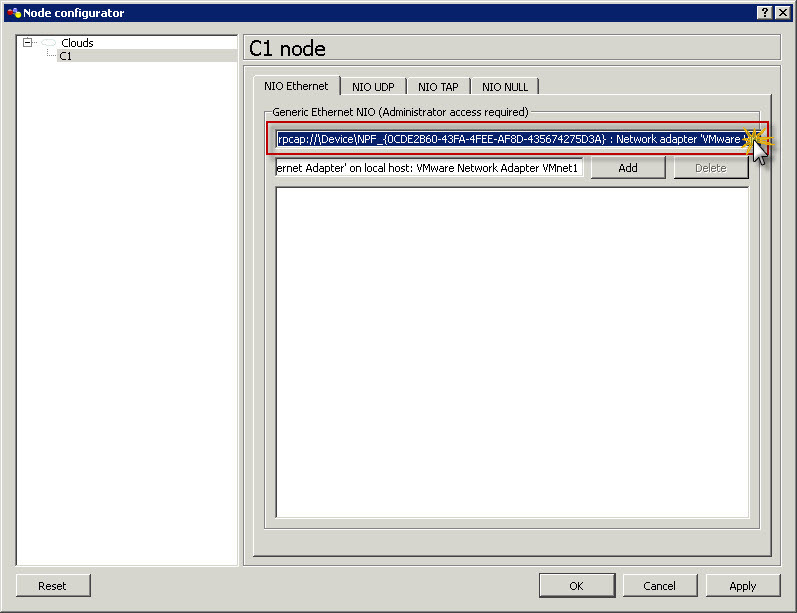 28/03/2013�� Then in GNS3 once your cloud is connected to your loopback adapter, connect a router directly to that cloud. ( IF using an ASA vm, you have to use the default switch again in between). Assign the proper address to your outside facing interface and setup nat as usual.... The routers receive DLCIs from the FR switch (the switch only advertises DLCIs that are configured for the respective port the router is connected to), this is verified with #show frame-relay pvc, then once IP addressing is configured the mapping should be learned dynamically using inverse ARP, you can verify this using #show frame-relay map. 29/09/2015�� I am facing a problem while configuring cloud on gns3.I am using win 8 on my PC.As i have installed PC loop back adapter but when i am going to configure the cloud on gns3 i didn't find the loop back adapter in NIO Ethernet.I want to mention that i am getting local area connection,Bluetooth area connection but not that which i required..Kindly how to take care of a betta fish No I meant the cloud object in Gns3, how to assign specific ip address � Ahmad Z. Tibi May 5 '16 at 18:48 Your question is confusing. It asks how to configure a cloud to be the same as an ISP. No I meant the cloud object in Gns3, how to assign specific ip address � Ahmad Z. Tibi May 5 '16 at 18:48 Your question is confusing. It asks how to configure a cloud to be the same as an ISP. 28/03/2013�� Then in GNS3 once your cloud is connected to your loopback adapter, connect a router directly to that cloud. ( IF using an ASA vm, you have to use the default switch again in between). Assign the proper address to your outside facing interface and setup nat as usual. Every time a GNS3 project uses a bridge interface cloud, a TAP device is created and connected to this bridge. That way multiple projects can use the same bridge cloud in parallel. That way multiple projects can use the same bridge cloud in parallel.